We want to inform you about some upcoming changes to OneDrive that will affect you. The amount of storage that comes with OneDrive will change from 15 GB to 5 GB. We are also discontinuing the 15 GB camera roll bonus. As a result of these changes, you will be over your OneDrive storage limit on July 27, 2016 (visit the Storage page to check your account). You can learn more at our FAQ. Way back when, I was lulled into moving much of my data to OneDrive while they were offering a generous 15gb plus another 15gb bonus for a total of 30gb free cloud storage. As became painfully obvious, what sounded too good to be true quickly became a thing of the past. Even with “high speed” internet connections many are likely aware that the high speed generally reflects the download speed while the upload speed commonly is considerably slower. 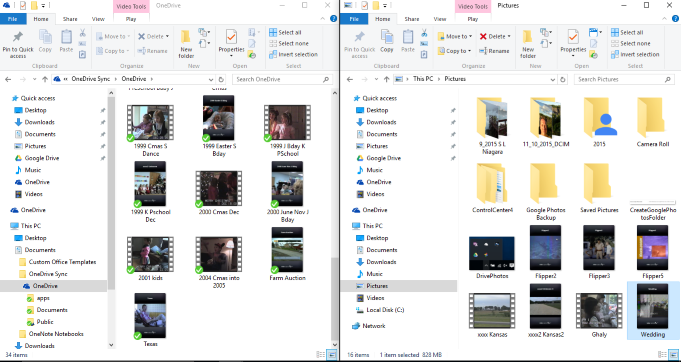 In short it took considerable time to move my data to OneDrive… I had a large music collection – about 7gb there; plus last year I finished my project of converting my family VHS-C tapes to digital and stored those files there as well (around 8gb or so). In short, I wasn’t looking forward to transferring all of these files to a new home but since this change appears inevitable I didn’t want to risk loss of cherished files so I am taking action and will reflect my experiences below. Tip: After converting these tapes to digital, I copied these files to memory sticks and give them out for Christmas to my wife and kids...this is a win-win-win, being a very thoughtful, personal gift, reducing the stress of Christmas shopping plus is a great backup strategy as it is very unlikely that all of these copies would be lost or destroyed. External memory – This includes both external hard drives as well as memory sticks. These are great ways to provide backups and I encourage them, but you need to be aware of their limitations. First, hard drives can fail so if your important data is solely on a hard drive, you are out of luck. The shelf life of a memory stick is a bit unclear to me – it seems like it may be for a long time, but memory sticks can also be damaged by such things as magnetism and like hard drives are vulnerable to catastrophic local events such as fire or flood. While these types of events may be rarer, the more frequent downside I experience with memory sticks is losing them and/or jumbling them up so I don’t know what is on which stick. While I use this media for local backup, it is clear that there are many advantages to cloud storage, among them they are commercially backed up across geographically dispersed sites (low risk for catastrophic loss) and your data is available across devices (phone, tablet, computer). Thus, I began my exploration of the cloud and started with the usual suspects – Microsoft, Apple and Google. Microsoft and Apple were relatively quick rule outs. As per my OneDrive message, Microsoft is moving to a chinchy 5gb of free space. Similarly, Apple provides 5gb via iCloud, but this 5gb is “shared” space among family members (wouldn’t do that again) and much of this space is already being consumed by iPad and iPhone backups. Google provides a generous 15gb of cloud storage free with one minor hitch that this space is shared amongst all of your Google applications. Thus, all of the many documents stashed in my Gmail account over the many years count toward this limit. In taking a quick look, I found that I was already about halfway to my storage limit. With my heavy use of Gmail, there is no way that I would want to tempt fate by dumping lots of data on Google Drive to bring me near the 15gb limit – having my email cut off would not make my day. I’ll note that I briefly entertained the thought of paying (a dirty 6 letter word) for cloud storage. Google currently offers a very reasonable 100gb for only $1.99 per month. Unfortunately, my fear is that this path is along the lines of a roach hotel where you check in but can’t check out – I’m not enjoying the need to move my 15gb or so of data from OneDrive so I’d hate to imagine the pain of moving say 90gb or so from the cloud. I also briefly considered spreading my stuff among the several accounts but avoided this due to the desire to avoid having my stuff all over the place and trying to keep track of what is stored where and watching multiple storage limits. At the risk of sounding like a Google advertisement, in the end it was Google to the rescue although not entirely through Google Drive as may have been anticipated. A while back, I was exposed to “Google Photos” from a Lynda.com session. Google Photos will provide free, unlimited storage of your photos as long as you use Google’s compressed “high quality” setting. My session from Lynda provided a head to head comparison of this “high quality” versus original and the difference was not observable on screen. For my amateur photos, this was an easy choice. I had already installed the Google Photos app on my iPhone and iPad so those photos were already out there. My next step was to start addressing the photos that I had strewn on my 2 laptops, on Microsoft OneDrive and on Google Drive. Since the catalyst to this project was Microsoft OneDrive one of my first steps was to set up OneDrive on my Windows 10 computer (OneDrive is “baked” into the operating system for Windows 10, but my recollection is that for Windows 7 there is a download to install). I set up my OneDrive to back up my content on OneDrive to my local computer. Once OneDrive is set up, this cloud storage will show up like a local drive in File Explorer. Next step was to download and install the Google Photos app for the “PC” (Windows 10 laptop). In doing this, you identify what folders / locations you want Google Photos to search and backup photos onto the Google Photos cloud (typical areas are the Photos or “My Photos” folder, the desktop and you may also identify whether to back up external storage devices when they are attached to the computer). This installation easily took care of the photos that were on my (2) laptops and SD cards. Moving existing photos from Google Drive to Google Photos was trickier than what one may think. Intuitively you would think that since they are both Google services that there would be an easy button to move your photos from Google Drive to Google Photos. Currently, this easy button does not exist. In reading the many comments on the web, I found my easiest route was to install the Google Drive app and have my Google Drive content back up to my computer. Then when that was done, move the photos from Google Drive to my Photos folder that I had identified in the Google Photos settings and then finally remove the photos from Google Drive (leaving them just in Google Photos). One quick note is that in experimenting, I did upload some photos from the browser directly to Google Photos. Later I caught that some photos still were showing as allocating space in Google Drive. If you use this route, you need to adjust your Google Photos settings to high quality in the browser (not just the installed app). Fortunately, when I caught this and went to adjust the setting in the browser, there was also an option in settings to compress your existing Google Photos to high quality. I was initially perplexed in regards to what to do with my family movies that I had converted to digital from VHS-C. I didn’t realize that Google Photos unlimited storage applied to video also! I’ll note that some of these individual files were large – the largest movie was about 750mb (3/4 of a gigabyte). Some may have concerns regarding having their cherished family memories compressed. I will reiterate that my observation of Google’s compressed “high quality” truly is high quality. Secondly, I will also remark that since these had been converted from tape their quality would not be equal to the quality of current digital standards anyway. In many ways, I was happy to have some of these huge files compressed as they then become easier to handle and stream. For example, that 750mb movie that I referenced compressed to about 330mb or so. Tip: Uploading these size files does take time and in the case of Google Photos these movies are being both uploaded and compressed so the length of time is greater than just doing an upload. I recommend going into your laptop to adjust your sleep settings so that your computer does not turn off and drop your connection while doing this. Once the decision became clear to move forward with placing the movies on Google Photos, the process became to open 2 sessions of File Explorer split to the left and right of the screen and then simply drag and drop 1 or 2 movies at a time from Google Drive to the Google Photos backed up location. As of this writing, I am making steady progress with the transfer but this is time intensive. On the plus side, this is something where you can let your computer work and let it sit. Further, as long as you are using the Google Photos app, the app will take look to your backup location and largely manage the process of putting your files from the locations you have identified on your local computer to the Google Photos cloud. Thus far, I have found Google Photos to be a great product and all the more remarkable because it is free. There are a few features where I would like to see some enhancements. As stated previously, it should be easier to move existing pictures from Google Drive to Google Photos. Initially I had hoped to share the entire Google Photos collection – I quickly found that the shared library limit is 1500 photos. I’d prefer not to have to create umpteen libraries. In researching this issue, a workaround seems to be to have Google Photos appear as a folder in Google Drive and then share the folder from Google Drive. I found the setting and turned it on so I now have the Google Photos folder within Google Drive; however, my web reading on this topic suggested that this wouldn’t give the ones you share with all the features of Google Photos. For example, I love the feature in Google Photos where you can select someone’s mug shot and see all the photos that include that person – its spooky cool. I don’t think this feature would be available when shared under Google Drive. In addition to the 1500 limit, I found it very difficult to make multiple selections within Google Play on the PC – I would click the first photo, hold shift key and scroll down then click the last photo and sometimes it seemed to take and often it didn’t. One final area where I thought there was an opportunity for improvement is with the status area. I would find it very helpful if this could provide more details particularly for large files. For example, I may hover over the Google Photos app and it may say “Backing up 5 new files, 4 left”. This message would stay the same for these large files for hours – it would be nice to know if you were x% done or an estimate of how much longer the backup will take. The second substantial piece of my OneDrive space quandary involved my music collection. Almost all of these were a result of a very large collection of CDs that I owned and “ripped” (copied) for my use on portable devices (iPod, MP3 player, etc.). This represented a considerable amount of time and effort so I would not want to have to go back and copy these CDs a second time. Once again, I found Google to my rescue in the form of Google Play Music and was delighted to learn that this service allows you to upload up to 50,000 songs which more than covered my collection. I was pleasantly surprised to also discover that I had explored this service several years back but sort of abandoned it when I found it hard to find the music that I had uploaded. This time around, I was able to quickly find my music “Googling” “Google Play Music and after sign in it brought me to a page where I saw “Music library” on the menu and found my music. I was initially going to just upload the music that was not already on Google Play Music, but found it very hard to cross walk my collection with what was already uploaded. Instead, I found it much easier to download Google’s Music Manager app for the PC and simply upload the collection that was on my PC to Google Play Music. I was pleasantly surprised to see that there must be some mechanism in the app to recognize duplicates as I only spotted 2 occurrences of duplicates being uploaded. While I haven’t spent an enormous amount of time with Google Play Music thus far, I have not spotted any obvious “gotcha”. There seems to be relatively easy ways to download either a single album or entire collection. It is also nice to have your music quickly accessible across devices without needing to copy the entire collection to each device. This can be very important on some mobile devices such as iPhones or iPads where space may be tightly limited to less than 8 or 16gb.